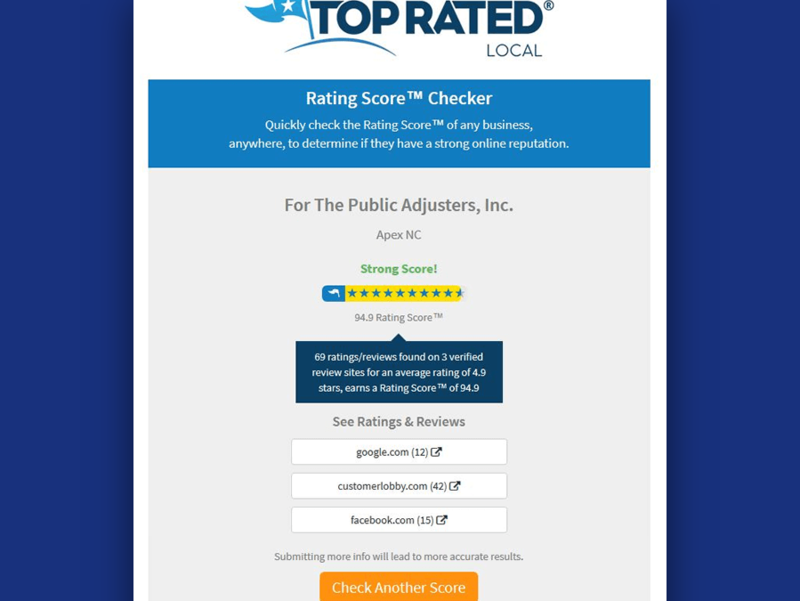 For The Public adjusters, Inc. of NC receives highest Public Adjuster Ratings for Public Adjuster Reviews from Top Rated Local. 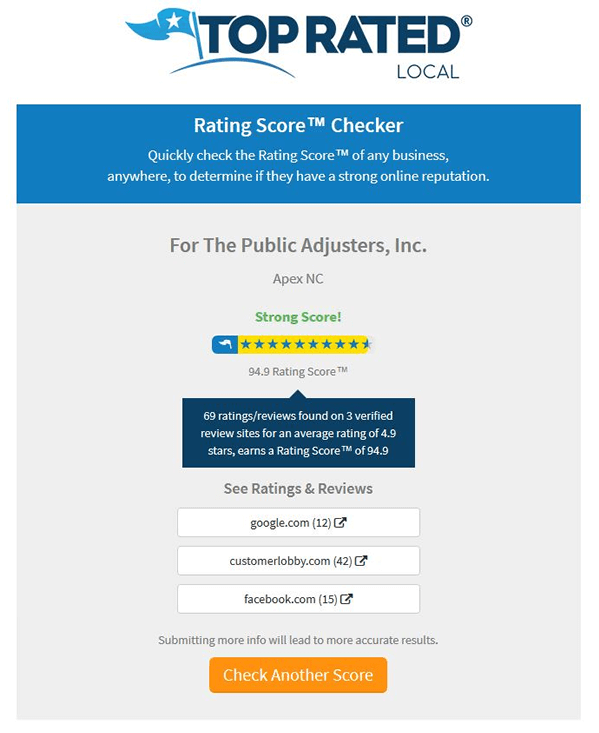 A search conducted through Top Rated Local’s Score Checker shows For The Public adjusters, Inc. of NC has an overall average Review Rating of 4.9%. This average is very high considering the average is from a whopping 69 online reviews (at the time of the review conducted in Jan 2018). The Score Checker produces an overall score for the business based on how many online reviews it has (in this case public adjuster reviews) and the average of those reviews. For The Public Adjusters are “Public Insurance Adjusters”. Why is this important for you? As public adjusters we are advocates for the policyholder in valuating and negotiating a policyholder’s insurance claim. Public adjusters are licensed by state departments of insurance. Public Adjusters are the only type of adjuster that is licensed by the state to legally represent the rights of an policyholder during the insurance claim process. Why would anyone want an adjuster that is employed by their insurance company be the only voice in how much it will cost to repair the damages to their property? That would be like being on trial for murder and having no lawyer to defend you. As you can see, there is a clear distinction between a “company” adjuster, who works on behalf of an insurance company, and a “public” adjuster who works on behalf of a policyholder… YOU.